How quickly 2018 is passing! Now that Easter is here, I want to make a list of the books I’ve read or at least explored in recent years, in order to turn back to them when Lent and Easter roll around next year. They have perennial value, well-suited for repeated reading. If you’re looking for something to accompany this season in any year, maybe one of these will interest you, too. Malcolm Guite, Sounding the Seasons: Seventy Sonnets for the Christian Year (2012). Amazon. Malcolm’s poems provide meditations for Ash Wednesday (p. 26), the days of Holy Week (pp. 32ff), the Stations of the Cross (pp. 37ff), and Easter dawn (p. 44). Listen to him read them aloud at his blog, where they are republished along with explanatory remarks and artistic drawings or photographs. Malcolm Guite, Word in the Wilderness: A Poem a Day for Lent and Easter (2014). Amazon. Poems selected from various authors with Malcolm’s illuminating reflections that open up each poem for meditation. Bread and Wine: Readings for Lent and Easter (2003). Amazon. Some of my favorites are excerpts from Romano Guardini on Thomas; Pascal on the mystery of Jesus; Wendell Berry on taking up the cross; Henri Nouwen on the Passion; Mother Teresa on thirsting; a John Updike Easter poem; C.S. Lewis on the strangeness of the Resurrection; Malcolm Muggeridge on the defeat of death; Dorothy L. Sayers on the drama of an incarnate and suffering God; Karl Barth on the Resurrection; Philip Yancey on the image of the cross. Pope Benedict XVI, Jesus of Nazareth. Holy Week: From the Entrance into Jerusalem to the Resurrection (2011). Amazon. One of three volumes on the gospels which superbly demonstrate how to combine biblical exegesis and theological reflection. The other two volumes which comprise this trilogy are subtitled The Infancy Narratives and From the Baptism in the Jordan to the Transfiguration. There may be no more insightful and accessible introduction to the person of Jesus. I recommend every evangelical read it. For me, I regard the volume on the Nativity among my essential annual Advent/Christmas readings. Dorothy L. Sayers, The Man Born to be King (Date). Amazon. A play of the life of Christ with the artful insight characteristic of Sayers’ notes on Dante. C.S. Lewis read this every year for Lent. Candace read in it this year. It’s #1 on my list for next year. Thomas F. Torrance, Atonement: The Person and Work of Christ (2009). Amazon. A magisterial synthesis of Trinitarian perspectives on atonement, redemption, reconciliation, the priesthood of Christ, the Resurrection and the Ascension, Pentecost and the Church. This is the second volume in a series on the Person and Work of Jesus Christ; the first volume, Incarnation, makes for great reading at Advent and Christmas. Thomas F. Torrance, Space, Time & Resurrection (1976). Amazon. A fuller presentation of material discussed in the chapters on the Resurrection and Ascension in The Atonement by Torrance (listed above). Also, indispensable for thinking through the relations between biblical teaching and concepts of space and time in modern science. Alan Lewis, Between Cross and Resurrection: A Theology of Holy Saturday (2001). Amazon. Thomas F. Torrance called this book “the most remarkable and moving book I have ever read.” Do we need any more reason to read it than that? While writing this book, Lewis, a professor at Austin Presbyterian Theological Seminary (Texas), suffered from cancer which ultimately claimed his life. This is his magnum opus, published posthumously. See the appreciative yet critical response by Lauber (next item, pp. 145ff). David Lauber, Barth on the Descent into Hell (2004). Amazon. Robert Dale Dawson, The Resurrection in Karl Barth (2007). Amazon. Paul Molnar, Incarnation and Resurrection: Toward a Contemporary Understanding (2007). Amazon. Starting with Barth, Rahner and Thomas F. Torrance, Molnar considers the views of a variety of theologians in order to explore how “the incarnation and resurrection are so closely related that if one is compromised in the slightest way then so too is the other.” This is #2 on my Lent and Easter reading list for next year. Fleming Rutledge, The Undoing of Death: Sermons for Holy Week and Easter (2002). Amazon. Forty-one sermons from Palm Sunday through Eastertide. This is #4 on my Lent and Easter reading list for next year. March 8. 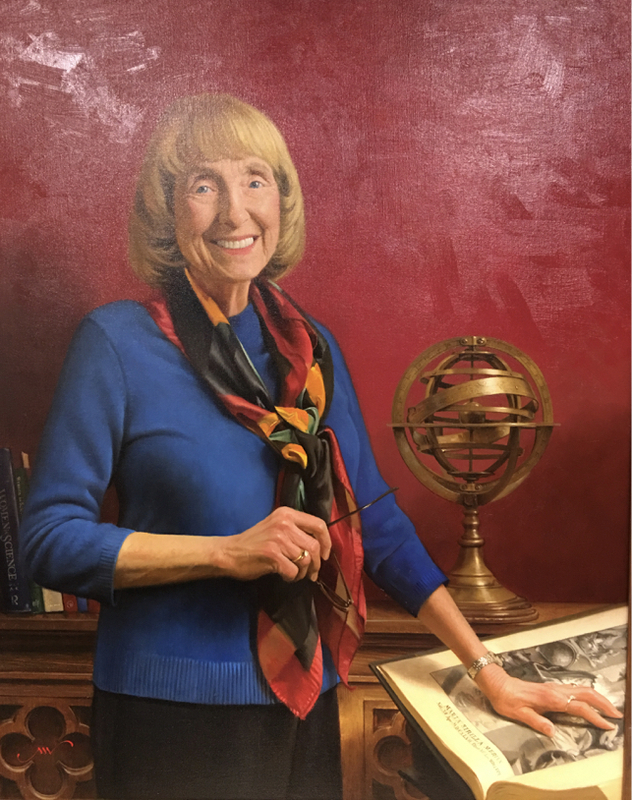 Reception at 6:45; lecture begins at 7:00 pm. John Brown University, Simmons Great Hall. This Thursday I have the privilege of presenting at JBU, invited by my friend Ken Hahn, as part of their biannual lecture series “Christian Discourses in Science & Mathematics.” The presentation is motivated by my understanding of the “Reconstructed Natural Theology” of Thomas F. Torrance – not apologetics in the sense of proving theology by means of science, but rather a searching out of how the sciences and other disciplines relate to one another in light of Christian Trinitarian theology. 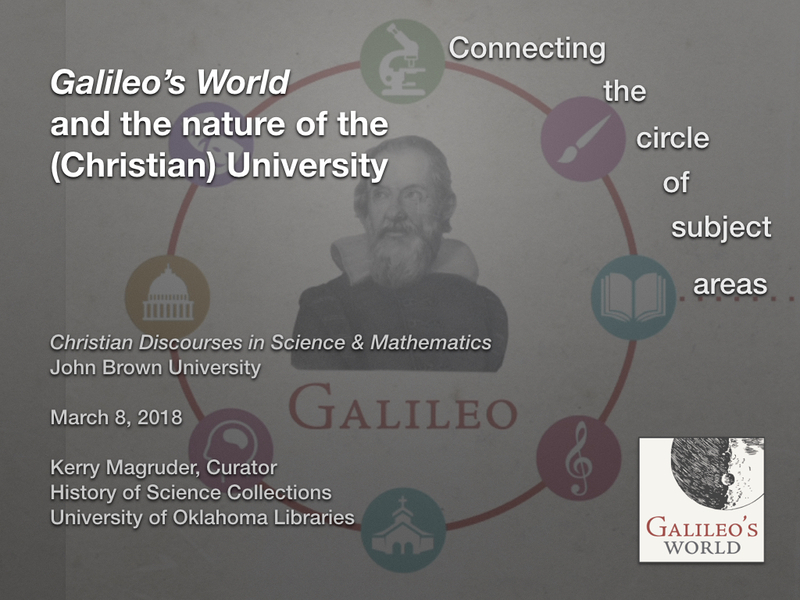 My title is “Galileo’s World and the nature of the (Christian) University: Connecting the Circle of Subject Areas.” A more accurate title might be “Historical explorations toward an onto-relational theory of disciplines.” Hopefully that will make more sense by the end of the presentation! The main point is simple: Instead of thinking just about how we integrate faith and learning within our own specific discipline, how do we think about faith and learning in a multi-disciplinary matrix? And if the most pressing problems facing the world today are multi-disciplinary, how might Christian colleges lead the way in conceiving each discipline as the servant of others? ABSTRACT: Any model of Christian education as the integration of faith and learning requires some kind of understanding of the relations between disciplines. In this presentation, we will reflect upon some implications for the Christian university arising from the world of Galileo. What particular aspects of the culture of early modern Florence sparked the creative discoveries and transformations we associate with Galileo and his Tuscan contemporaries? 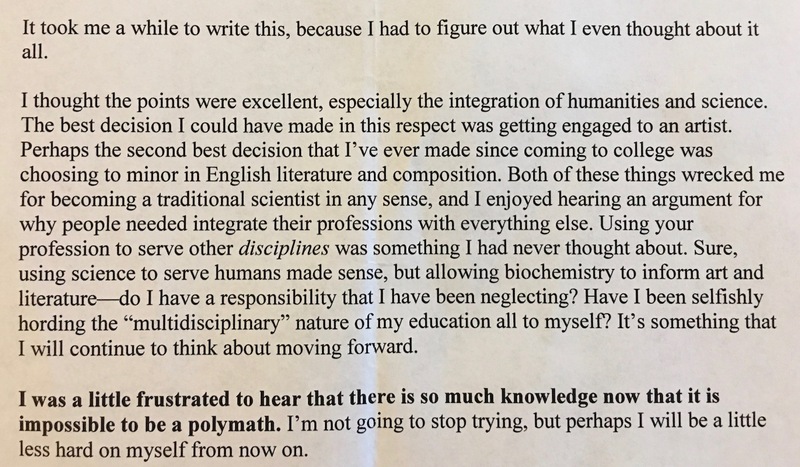 What examples might they offer us, both positive and negative, for the connections between disciplines? Galileo’s world illustrates how sparks of creativity arise from certain kinds of interdisciplinary relations and not from others. Healthy traditions promote connections between disciplines that spark creative transformations. We will try to discern how an ideal of mutual service between academic disciplines lies at the heart of a Christian intellectual community. In a Christian education, the disciplines each look upon one another as better than themselves in search of natural, organic, and creative connections. 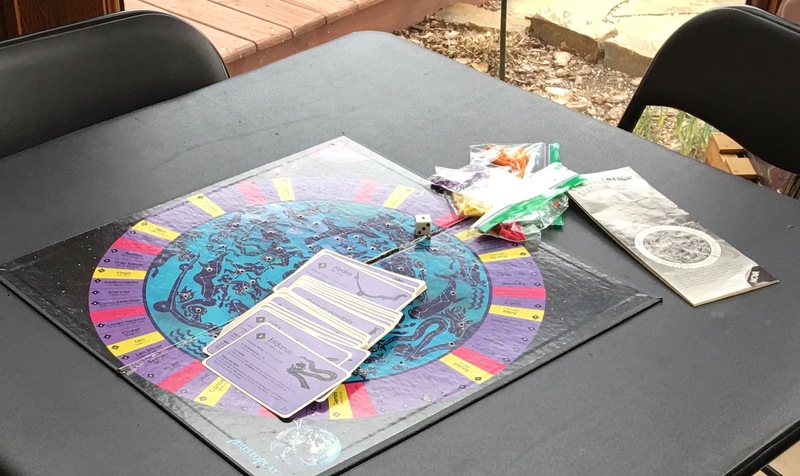 At a star party last night, 13 central-Oklahoma amateur astronomers treated residents of the Flaming Oaks neighborhood to beautiful views of the universe from our own front yard. We traced the constellations of the Winter Hexagon and the circumpolar stars. We enjoyed telescopic views of the Pleiades, the Owl Cluster and the Beehive Cluster, among others, including the Great Nebula in the sword of Orion the Hunter. What a privilege and joy to live in east Norman where the skies are dark enough to see the Milky Way! 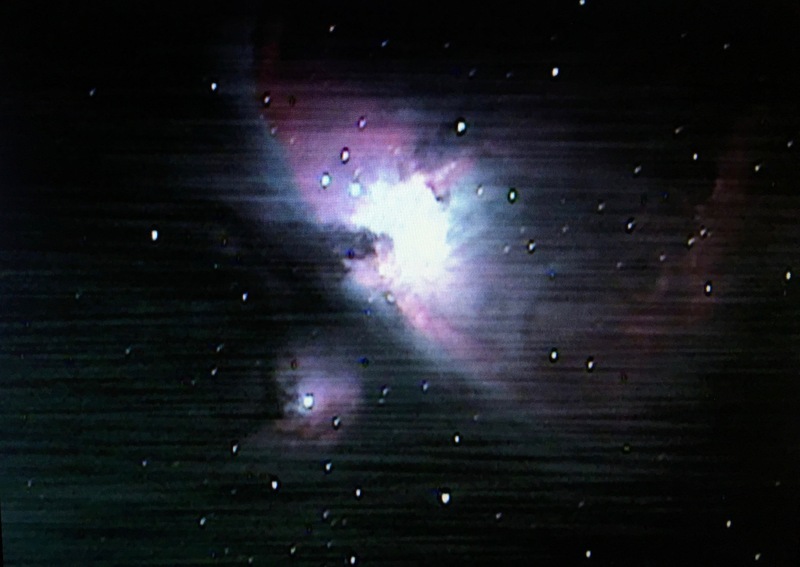 Peter Khor pointed his telescope to the Great Orion Nebula, and displayed this view of the Great Orion Nebula on an attached Mallincam screen. Great Orion Nebula, as seen last night in Flaming Oaks. What a memorable evening these astronomers gave us! Thanks to all of you for devoting an evening to sharing your love of the night sky with us. We particularly thank 6 of Eileen G.’s students from the Norman North High School Astronomy Club. They were joined by Nick Lazzaro from the Ten Acre Observatory and Odyssey Astronomy Club, among others. Indoors, there were stars as well — adorning the varieties of cookies many FOHA neighbors brought! We enjoyed them over friendly conversations, coffee, tea and hot chocolate. A special thanks to Joyce McBee and DeeAnne Lyon for lots of help organizing and setting up. And thanks to Eris J., a Brownie Girl Scout, for setting up a display where we could purchase our own Girl Scout cookies! Eileen G. led us in a dramatic reading of There Once Was a Sky Full of Stars, a children’s story about keeping the sky dark. She then shared information about full cut-off light fixtures, easily obtained from Lowes or Home Depot, which keep light directed toward the ground where it is needed, instead of throwing it up into the air where it creates glare and unnecessary skyglow. Eileen G. and Nick Lazzaro explaining the use of full cut-off light fixtures. I encourage everyone who lives in east Norman to choose only full cut-off light fixtures for your outdoor lighting. Star clocks – tell time by the Big Dipper. 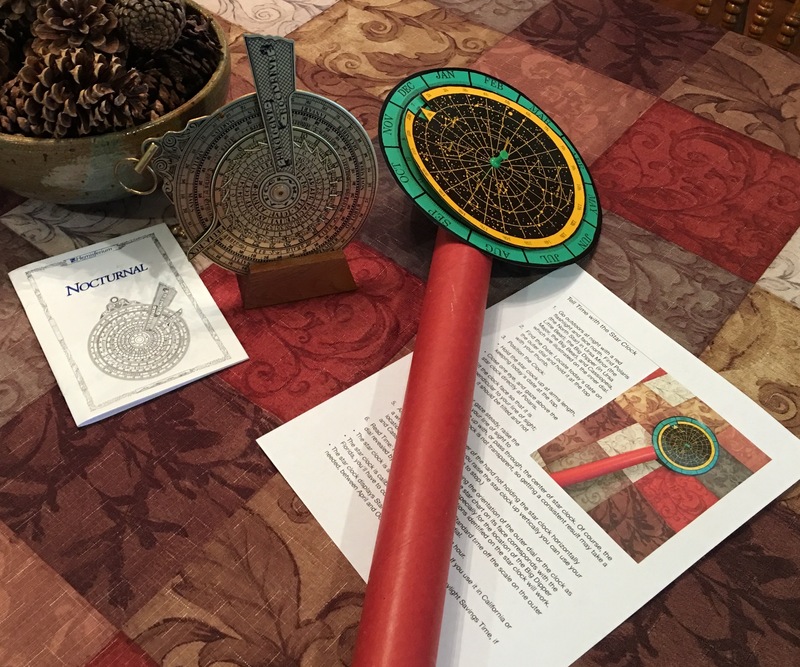 Star charts and astronomy events. Cf. Night Sky Planner, Postcards from the Universe, and Star Atlas Stories. Time now for a thin mint cookie… Did you know Girl Scouts now sell gluten-free cookies? Mmmmm. On Thursday this week, it was a delight and an honor, with Brent Purkaple, to kick off the OU Department of Astronomy’s year-long series of monthly lectures, “Postcards from the Universe.” Brent and I delivered a presentation on constellations and the interweaving of science and art, entitled Historic Star Atlas Stories. That link contains an outline with links to further information on each of the historical sources; a downloadable pdf of the slides; and a video (although the video quality does little justice to the more than 230 richly-illustrated slides). I think it went well. All comments we received were positive, but any naysayers would not be the ones to give us feedback. The auditorium was virtually full. It was a wonderful cross-section of the community. Lots of high school students, but lots of adults and families with kids as well. And educators. The Lunar Sooners, Eileen G.’s students, Nick Lazzaro, and some OKC Astro Club folks all put on a great show outside – beginning with taking us all out before the lecture to watch the International Space Station pass overhead at 6:53 pm. The consensus among the skywatch leaders seemed to be that about 50 people lingered for telescope viewing after the presentation. One of our goals in kicking off the Postcards series was to create in everyone the desire to participate in the post-lecture skywatches throughout the year. More than 20 made it up to the Library Exhibit Hall as well — and lingered right up until closing at 10 pm. The best part of the evening was the opportunity to present Anna Todd’s story, Hoot the Owl. Here’s the backstory. So far as I’m concerned, that’s the one of the best things that happened in 2017 related to our exhibits. To top it off, Stacey (the educator who made it possible) was present in person to hear the audience give a round of spontaneous applause after Hoot the Owl was read aloud. Why not hold a special “Astronomy of Middle Earth” themed skywatch? It would also make an ideal way to cap off a Feast of Middle Earth. 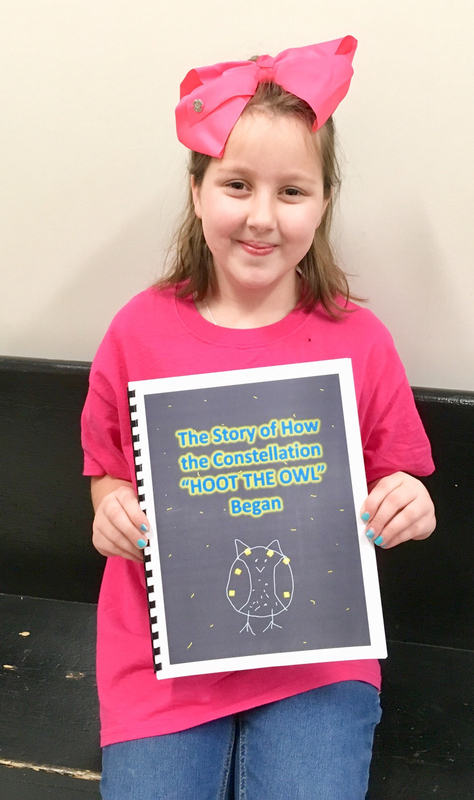 We believe that educational outreach is at the center of our exhibitions, so nothing could have excited us more than a letter we received last November when Stacey Stevenson told us the story of “Hoot the Owl.” A children’s book, The Story of How ‘Hoot the Owl’ Constellation Began, was written and illustrated this past Fall by Anna Todd, a 2nd grade student at Rose Witcher Elementary School, El Reno Public Schools, located in El Reno, Oklahoma. Hoot the Owl is not one of the 88 official constellations recognized by the International Astronomical Union, but it’s my new favorite constellation! You can read the book and learn the backstory below. As you will see, the story of Hoot the Owl is a specific, concrete example of how knowledge of the stars enhances our lives today. Anna Todd, The Story of How ‘Hoot the Owl’ Constellation Began (2017). Written and illustrated by Anna Todd, 2nd grade student at Rose Witcher Elementary School, El Reno Public Schools, El Reno, Oklahoma. CC-by-nc-sa. 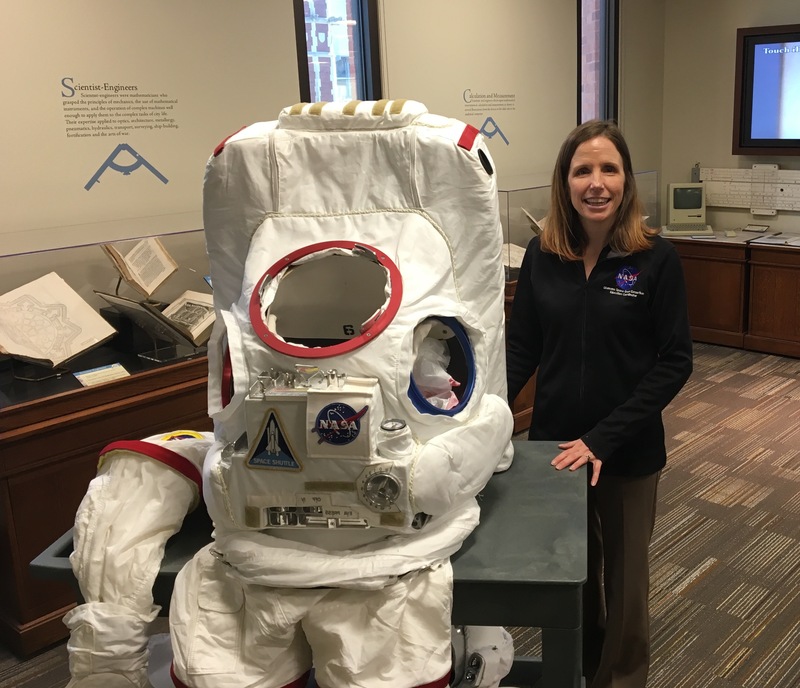 Dorinda Risenhoover demonstrating a Space Suit in the Exhibit Hall. We so admire Dorinda’s leadership and vision for supporting educators in this state, and appreciate her decision to bring the participating educators to OU Libraries for an all-day workshop, which we held for them last September, to introduce them to open educational resources (OERs) developed for the Galileo’s World exhibit. Stacey (far right) at the September workshop. Left to right: Sharon Scott, Rashid Troupe, Stacey Stevenson. Good evening! I hope this email finds you well. I would like to share a story of early inspiration with you. I have been tutoring a 2nd grader in reading for my Diagnostics in Reading course. We have read over 50 books since we started working together. From the beginning I told her to keep in mind, as we read, that she would be writing her very own book at the end of the semester. I told her to consider the subject matter of the books we read and the illustrations as well. Early into the semester we read Fancy Nancy Sees the Stars. The book is a level 1 reader and it explains planetariums and constellations so early readers can understand. When we were finished, she was fascinated by the idea of constellations. That night I put together several of the materials that were given to me during the HOS [workshop on] Galileo’s World. I also bookmarked a few of the pages from your site as well. 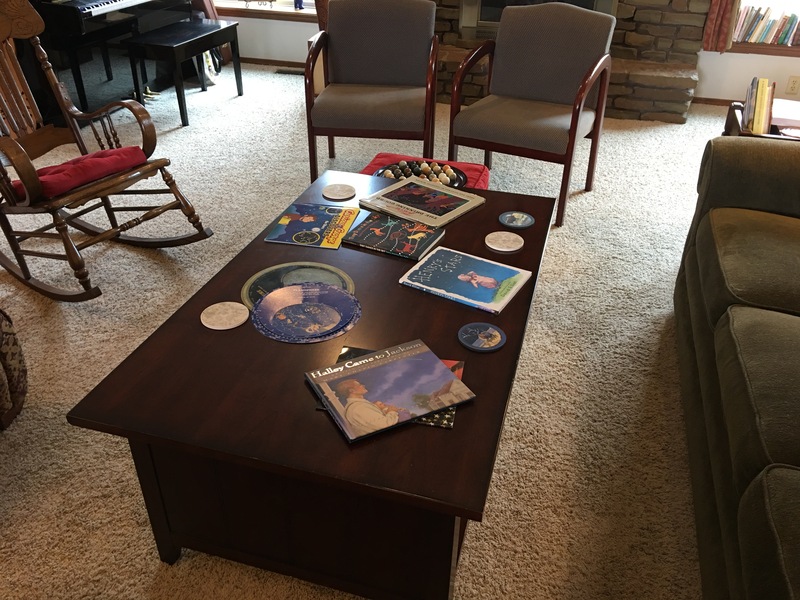 The next time we met I had checked out a few more children’s books on constellations, brought my HOS materials and my laptop. She was in awe, absolutely consumed by the idea of constellations. She was able to comprehend that the pictures were not actually in the sky but “imaginary, for my heart to see but not my eyes”, those are her words. We read the captions connected to the images on the materials you handed out and on the website. After a few meetings of reading only about constellations and stars, she decided to write her book about a constellation. She decided to make up and create a story as to how the constellation came to be. 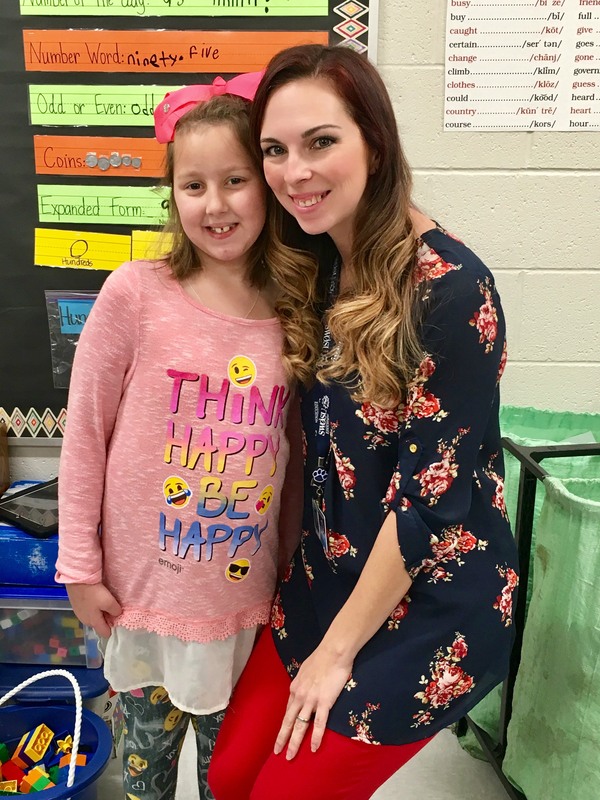 The story is absolutely fantastic and she has told her teacher, her family, and her classmates all about constellations and some of the stories she has been able to remember. I really want to thank you. 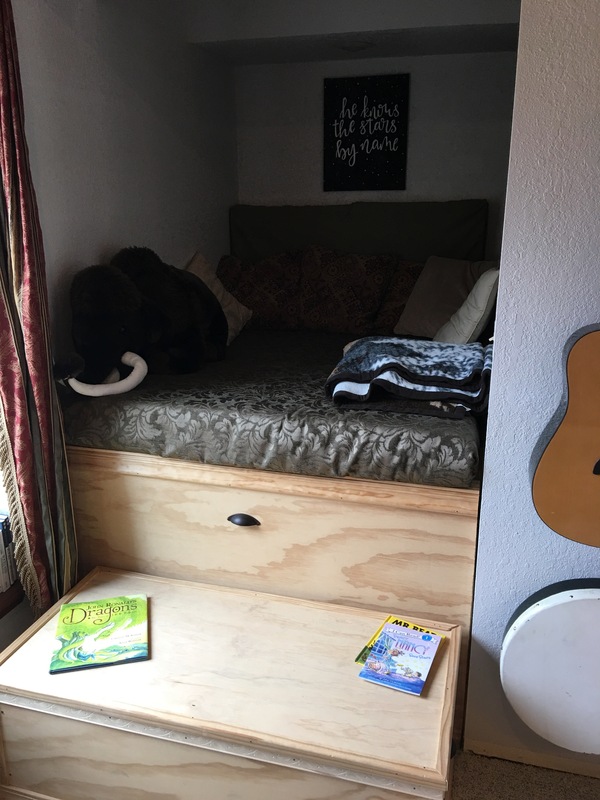 I was struggling to find a subject for her to really connect with, to give her the desire to read. To her, reading was boring. She had no heart for it and did not enjoy it. She enjoys reading now. She says, “The more I practice reading, the more I will be able to read about the sky when I am older and can understand the biggest words of all”. I have mailed you a copy of her book. I hope you enjoy the newest constellation “Hoot the Owl”. What a story “Hoot the Owl” is! Such drama! What a plot, what a flow, how colorful! Anna wrote with amazing creativity! And to think Anna caught her love for reading from Stacey’s intervention — educators make such a huge difference in young students’ lives. Generations from now there will be ever-enduring effects from what an educator does with just one student this very semester. Maybe Anna, and her fellow students, will write many books… teach astronomy or literature or reading… or go to Mars. As for now, in the 2nd grade, Anna wears beautiful bows, and looks great in pink! Even Anna’s sweater expresses her love of the stars! 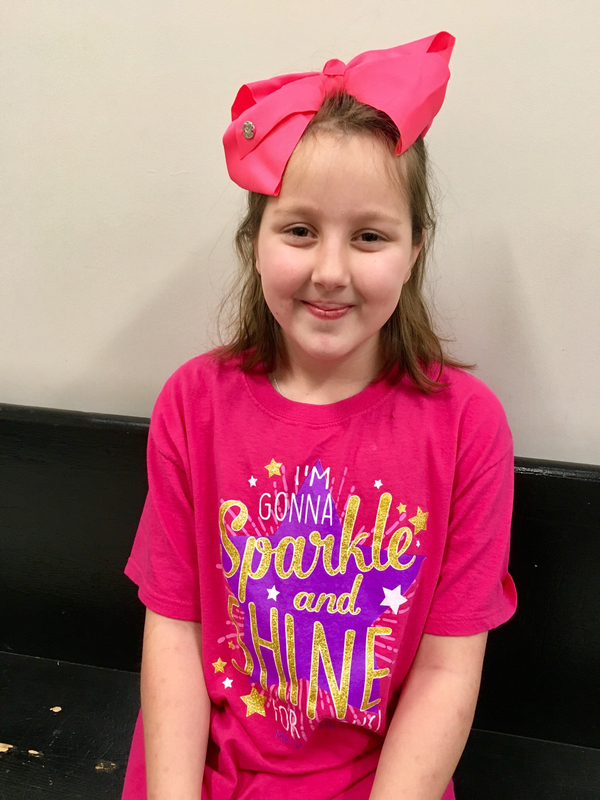 Congratulations to Anna and all of her fellow students at Rose Witcher Elementary School! We’re sure her principal, Mrs. Tiffany Patrick, and all the teachers are quite proud and super-excited about her new book. An original, laminated copy of Hoot the Owl has been placed in the Marilyn B. Ogilvie Exploration Room. 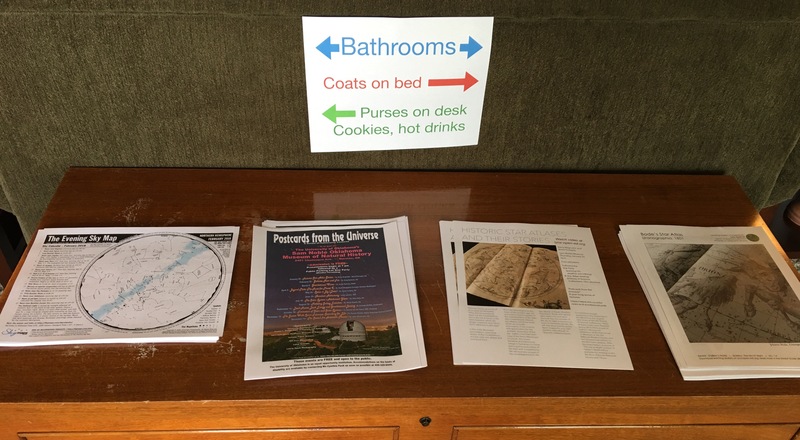 The Exploration Room is part of the OU Libraries’ Exhibit Hall on the 5th floor, where the Galileo’s World Reprise exhibit continues. 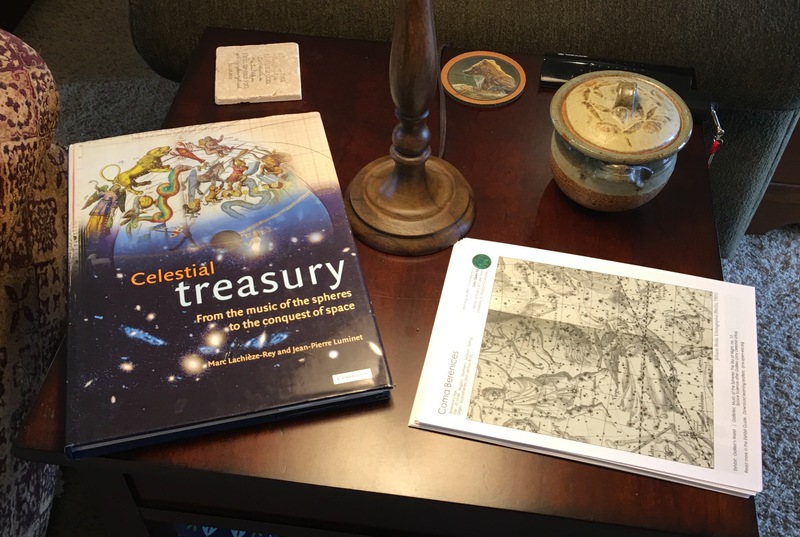 Here, alongside other books in the Exploration Room, children who visit Galileo’s World can read Anna’s story, right where they might sit down to color their own constellation pages and imagine their own stories of the stars. We are grateful to be able to share Hoot the Owl in both our on-site and off-site educational programs, and to share it in the Lynx Open Ed website. We think many other young children will be inspired by reading Hoot the Owl. We also think many educators will be encouraged by its example to encourage their students to write their own constellation stories. Hoot the Owl also has been placed in the ShareOK repository of the University to guarantee that it will remain available in perpetuity. 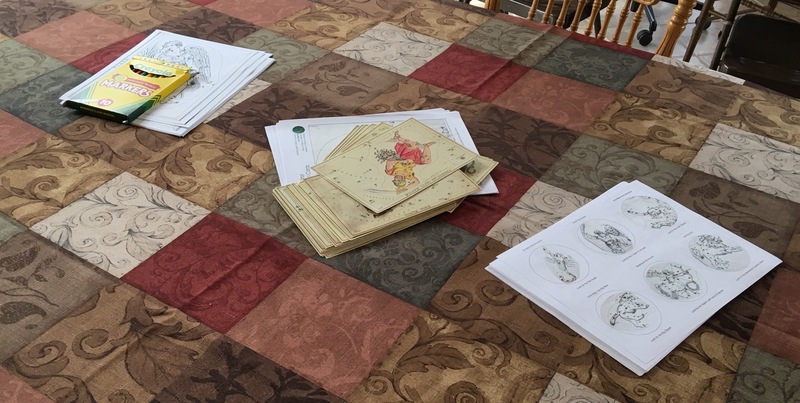 We’re grateful to Anna Todd and her family, and to Stacey Stevenson, for giving us full permission to share Anna’s book, this story-behind-the-story, and these photographs with you. Anna’s book is published with a Creative Commons license to share-alike, for non-commercial purposes, with attribution (CC-by-sa-nc). 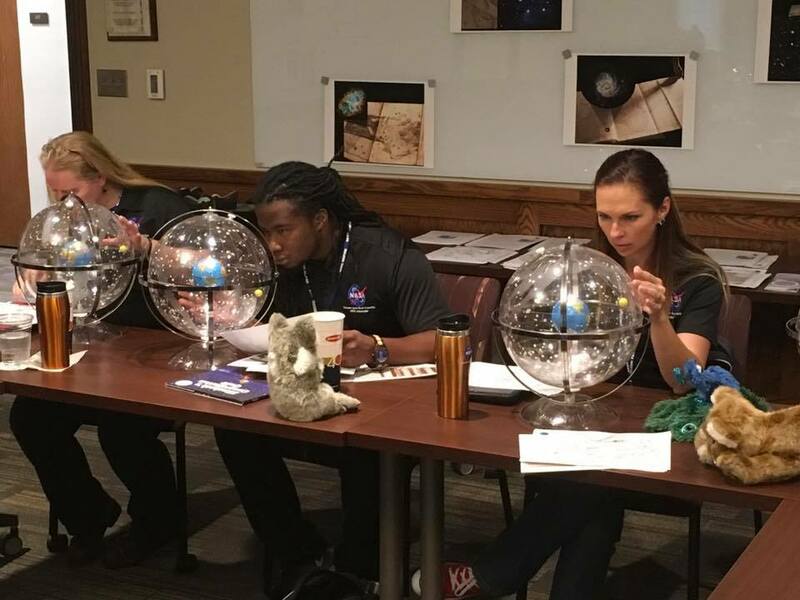 * MORE ON MTPE: The NASA OSGC Year-long Pre-service Educator Mentorship: Mission To Planet Earth is designed to empower pre-service educators from each of our eight affiliate universities (OU, OSU, SNU, ECU, Langston, Cameron, SWOSU, SEOSU) as STEM educators through a year of unique and hands-on STEM institutes, engagements, VIP NASA center tours, and more! Participants network with NASA educators, researchers, scientists, museum curators, and other leading STEM-related experts while utilizing the latest iPad technology. At the end of their year-long mentorship with NASA OSGC, the end goal is that each participant graduates the program with a passion and motivation to seek any and all opportunities in order to empower our next generation of STEM thinkers and doers through aerospace education as they begin to influence young minds in their own classrooms. In “The Hazard of Modern Poetry,” Erich Heller wrote about the challenge writers face in a culture where there is no common idiom, no shared symbolism, by which they might convey meaning intelligibly. In such a world, it’s a special treasure to recognize a moment of real communication when an experience of shared meaning through art takes place. I recall an instance of this, when my mentor, Marilyn, with joyous glee, once recited the entirety of Williams’ poem at my mere mention of “white chickens.” Of course, it’s a wiser or more courteous practice to avoid making allusions that are mere speaking in tongues, without an interpretation being present, but yesterday I forgot and blurted out something about how such and such might happen depending on the white chickens. I have also loved the poem for how its form reinforces its content. The line breaks cause me to slow down. In much of life, I just plow through as fast as I can. When reading a newspaper or website, I can adopt the same tendency to just skim for the gist or to read simply for bits of information. Each line break in the poem shouts a firm caution against that. The slower pace the line breaks prompt, repetitively, reinforces the call of the poem to attend to the ordinary, to the significance of the small things that are often overlooked, i.e., the red wheelbarrow and the white chickens.